Hello, my name is Raheem and I am the Branch Manager for the East Midlands Airport branch. My team and I welcome you to our East Midlands branch, located just outside East Midlands Airport. 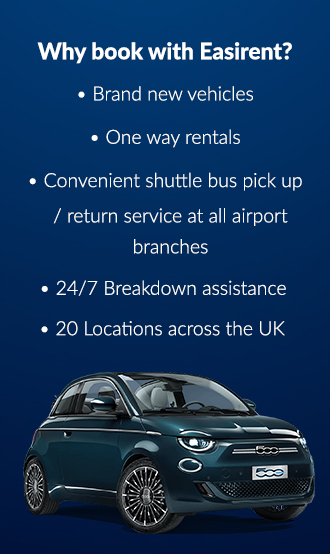 We have a large selection of hire cars all ready for collection and if you book online, direct at our official website we always guarantee the lowest price for your East Midlands Airport car hire. Arriving at East Midlands Airport by air, once you collect your luggage please telephone 0133 247 7170 to arrange your shuttle bus transfer to our location. Arriving at East Midlands Airport by train. The Skylink bus network connects East Midlands Airport with train routes to Derby, Nottingham, Long Eaton and the rest of the East Midlands. Arriving at East Midlands Airport by bus. There are Skylink bus routes to the airport from nearby Leicester, Nottingham and Derby. Dropping off your car at East Midlands Airport, We are located at the Moto Donnington Services, Junction 23A on the M1. Please return your rental car to the Easirent Office and you will be transferred back to the airport in the shuttle bus. The journey from the branch to the airport is approximately 5 minutes. BMIBaby, BMI British Midland, Eastern Airways, First Choice, Thomsonfly and easyJet. The Servisair lounge – open 5-1930 daily. Cost of £16.00 per passenger offering beverages, newspapers, fax, phone, internet and television. No children allowed in under the age of 12. Entertainment: A video games zone is situated in the Terminal and Indoor aircraft viewing balcony in the Trent Café. Child friendly areas: In bars with high chairs, no smoking and TV. Toys and games available in Dominoes Toys. Rascal Rabbit Kids Club for children up to the age of 12. Members of the Club receive a birthday card and a quarterly newsletter. The East Midlands Airport Information Desk is in the main terminal and open 24 hours. Within the terminal building free access for up to 60 minutes (Called EMA Public WiFi). Premium rates also apply for excess streaming, see airport website for further information on prices. A range of shops in the main terminal and international departures area including health and beauty, books and music, toys and duty free shops. A number of take away outlets and also the Meden Food Village.